Our sponsor this week is Audible, the Internet's leading provider of spoken audio entertainment, providing digital versions of tens of thousands of audiobooks for download to your computer, phone and MP3 player. 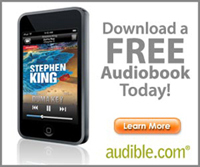 Sign up today to try Audible free for 30 days and get a free audiobook of your choice. Thanks to Audible for sponsoring the site this week. If you would like to advertise on Longform, get in touch.